OTC Beauty Magazine (OTC): Please briefly describe the history of Combe. How did this company get started and what is it founded on? Combe Incorporated (CI): When Ivan B. Combe founded the company in 1949 his mission was to create products that meet real consumer needs that no other company was paying attention to or knew how to fix. He was an innovator, not an imitator, and it’s still the same today at Combe. Our current brands are category leaders in feminine health and intimate skin care, men’s hair color and grooming, and oral device care. Building on Ivan Combe’s vision and leadership, his son, Chris Combe oversaw the robust growth of our company for two decades until his recent retirement as CEO. Today, Chris’ daughter, Keech Combe Shetty, and son-in-law, Akshay Shetty, are steering our company into the future. You could say we are now in our third generation of Combe entrepreneurialism—building on our flagship brands, but always searching for our next breakthrough idea, ever-inspired by our company’s iconic big hits of the past. OTC: What brands make up Combe’s product offerings? Our readers may be surprised that they are familiar with so many of them already! CI: Our products break down across male and female targets as we focus on men’s grooming and gray care, and women’s intimate health. OTC: What differentiates this company from the others in the multicultural beauty industry? CI: Many of the companies in the multicultural industry launch items that are specifically targeted to that consumer. Combe has a mass-market approach/appeal that cuts across all markets (Mass, Drug, Food, Multicultural). The items we introduce are targeted towards a specific consumer need. Combe takes a TOTAL market approach by grounding our insights in human truths that transcend cultural barriers. We leverage these insights to develop effective solutions and communication that strongly resonates with consumers of all ethnicities and cultures. OTC: Please explain how your OTC store partners and our readers can benefit from carrying Combe products. CI: Combe products resolve some of the most common skin, hair and health concerns that are experienced by Black and Hispanic Americans. Our significant advertising investment drives foot traffic into stores. This higher level of awareness driving advertising support, coupled with our portfolio of iconic heritage brands, will help your stores increase foot traffic, consumer satisfaction and higher profits for store partners. OTC: What is it like to have a business relationship with your company? What do you consider your strengths? CI: Just like our multicultural retailers need to create a personal relationship with their customers to develop loyalty, Combe treats our relationships with our retailers and distributors similarly. We consider our company the most personal, personal care company in the world. Being personal with our retailers and distributors allows us to understand what makes them successful in our categories and continue to deliver solutions to drive that success. OTC: What do you feel is the most important thing for multicultural beauty store owners to know when recommending your company’s products to their customers? Do you have any marketing tips to share? CI: The most important thing multicultural beauty store owners should know is that when they’re recommending Combe’s products to their customers, they are recommending high quality products that will exceed their customer’s expectations. In addition, Combe has a fully staffed consumer support department that is available to assist over the phone or online should a customer get a product home and determine they have questions. So, the owners should be confident that they will not lose customer confidence in the products they supply when they recommend Combe brands. OTC: What trend have you seen grow the most over the past year, and how has the company met consumer demand for it? CI: Simplicity! Men are seeking remedies that work, which can be easily integrated into their daily routines without an additional step. Our newest innovations deliver on this better than our competition. 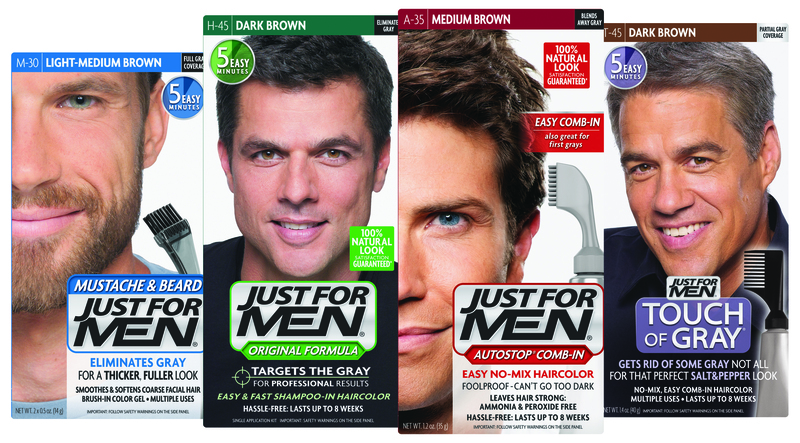 Combe has greatly expanded the options for men of all backgrounds to do something about their gray hair with breakthrough offerings such as partial gray coverage (Touch Of Gray), No-Mix permanent hair color (AutoStop) and our most recent innovation: a shampoo that gradually reduces gray (Control GX). Aqua Velva 5-in-1 Sensitive Aftershave Balm relieves the top five shaving related skin issues impacting men with sensitive skin and also helps to prevent ingrown hairs and razor bumps, while relieving razor burn and redness. OTC: What tradeshows have you been a part of, and what others are on your radar this year? What value do these events present your company as well as show visitors? CI: Combe has attended several multicultural trade shows this year. Our primary objective for attending has been to assist with educating retailers about our new and existing products. The categories that Combe competes in are categories that require consumer education. If our retailer partners are educated on our products and can assist the customer on making the right product decision, that customer is more likely to make repeat purchases than a customer who makes a purchase mistake, in turn, delivering incremental sales and profits for the shop owners. Since the shop owners are also very close to the customers shopping their stores, they are a great source of insights for Combe, as well! 다문화적인 미용산업은 경쟁 시장 속에서 매우 독특한 형태를 띠고 있으며, 저희 OTC 뷰티 매거진은 개개인의 특성이 이 산업을 더욱 특별하게 만든다고 보고 있습니다. 하지만 저희는, 다양한 유통 업체를 통해 광범위한 고객층에게 어필할 수 있는 회사 혹은 브랜드에 대해서도 감사한 마음을 표하고 싶습니다. 이번 달 저희는, Combe 주식회사의 대표분 들과 이야기를 나누며 효과적으로 “문화적 벽을 초월한” 이 회사의 이야기를 들을 수 있었습니다. OTC 뷰티 매거진 (OTC Beauty Magazine, OTC): Combe 회사 연혁에 관해 간단히 설명해주십시오. 어떻게 시작하였으며 어떤 걸 기초로 만들어진 것입니까? Combe 주식회사 (Combe Incorporated, CI): 1949년 Ivan B. Combe 씨께서는 회사를 설립할 때, 고객들이 진정으로 필요로 하는 물품 즉, 당시 그 누구도 주의 깊게 보지 않았고 어떻게 고쳐야 할지도 몰랐던 것들을 만들고자 하셨습니다. 그는 누군가를 모방하는 것이 아닌 항상 혁신을 추구하셨으며, 현재 Combe 는 그 정신을 그대로 이어받았습니다. 저희 브랜드는 여성 건강, 스킨 케어, 남성 헤어 컬러, 그루밍, 구강 위생 용품 카테고리 부문에서 선구자의 위치에 서있습니다. Ivan Combe 씨의 비전과 리더십을 이어받은 아드님, Chris Combe 씨는 당시, 최근 CEO로서 은퇴하신 오늘날까지의 약 20 년 앞 자사의 강력한 성장을 미리 예견하셨습니다. 현재는 Chris 씨의 따님이신, Keech Combe Shetty 씨와 사위이신 Akshay Shetty 씨는 회사를 미래로 이끌어가기 위해 노력하고 계십니다. 현 Combe 기업가 정신은 제 3 세대를 구축하고 있으며, 주력 브랜드를 더욱 더 굳건하게 하면서도, 과거 자사의 상징적인 히트상품들을 토대로 새 돌파구적인 아이디어를 추구하고 있습니다. OTC: Combe 의 메이크업 브랜드 제품들에는 어떤 것들이 있을까요? 저희 독자들이 친숙한 이름들을 들으면 놀랄지도 모르겠군요! CI: 바지실 (Vagisil), 저스트 포 맨 (Just For Men), Sea Bond, Lectric Shave, 브라일크림 (Brylcreem), Aqua Velva, 존슨즈 풋 솝 (Johnson’s Foot Soap) 그리고 윌리엄스 머그 솝 (Williams Mug Soap) 등이 있습니다. OTC: 제품들의 주 구매층은 누구이며, 어떤 절차를 통해 그들이 필요로 하는 부분을 찾으시나요? CI: 아무래도 저희가 남성 그루밍과 흰 머리 케어 그리고 여성 건강 등에 주력하다 보니 남성, 여성 가릴 것 없이 모두 주 고객층으로 잡고 있습니다. OTC: 다문화적 미용 산업에서 다른 회사와 차별화를 두는 것에는 어떤 것이 있나요? CI: 다문화적 산업에 있는 많은 회사들이 오직 그 고객층을 타겟으로 삼고 상품을 출시합니다. 그에 반해 Combe 는 대중 시장 (Mass-Market) 을 이용, 모든 시장 (대중, 약품, 음식, 다문화적) 에서 고객에게 어필하고 있습니다. 저희가 소개하는 물품들은 모두 고객이 원하는 그 특별한 무언가에 초점이 맞춰져 있습니다. 문화적 벽을 초월하는 사람들의 진실함을 토대로 저희는 모든 분야의 시장을 목표로 하고 있습니다. 저희는 이런 통찰을 활용하여, 모든 민족과 문화의 소비자들을 아우르고 공감하게 만드는 효과적인 해결책과 대화를 이끌어냅니다. OTC: OTC 상점 주들과 저희의 독자들이 Combe 제품을 들여놓음으로써 얻는 이점에 대해 설명해 주시겠습니까? CI: Combe 제품들은 흑인과 스페인계 미국인들이 흔히 겪는 피부, 머리, 건강 문제 등을 해결해 줍니다. 저희가 광고에 하는 주요 투자들은 사람들의 발길을 상점으로 이끕니다. 이렇듯 광고로 힘 입은 높은 수준의 인지도는, 고객에게 상징적인 명품 브랜드의 이미지를 심어주어 더 많은 손님이 찾아오게 할 것이며 이는 결국, 고객만족과 상점 주 분들께 많은 이익을 가져다 줄 것입니다. OTC: CI 와 함께 비즈니스 관계를 맺는다는 것은 어떤 것일까요? 어떠한 강점들이 있는지 설명해 주시겠어요? CI: 저희의 다문화 소매업자들이 고객들과의 친분을 형성하며 고객 충성도를 높이듯이, Combe 또한 비슷한 방식으로 소매업자, 유통업자들과 관계를 쌓아갑니다. 저희 회사는 세계에서 가장 친근하고 쉽게 가까워질 수 있는 회사라 자부합니다. 소매업자, 유통업자들과 이런 개인적인 관계를 유지함으로써, 그들을 더욱 이해하게 되고 이런 지속적인 해결책의 제시가, 결국 어떤 것이 그들을 성공으로 이끄는지 보여주는 계기가 된다고 믿고 있습니다. OTC: 다문화적 뷰티 제품 상점 오너 분들이 고객에게 본사 제품을 추천할 때 알아야 할 가장 중요한 점은 뭐라고 생각하시나요? 마케팅에 대한 팁이란 게 있을까요? CI: 다문화적 뷰티 제품 상점 오너 분들이 고객에게 자사 제품을 추천할 때 알아야 할 가장 중요한 점이라 하면, 그들이 고객이 갖고 있는 기대 이상의 고품질 제품을 추천한다는 것을 알아야 한다는 것입니다. 또한, Combe 는 고객이 제품을 구입한 후 가질 모든 의문점들에 대해 해결해드릴 완벽한 고객 센터를 보유하고 있습니다. 고객은 전화 혹은 온라인을 이용해 도움을 받을 수 있습니다. 따라서, 상점 주 분들은 저희 제품을 팜으로써, 절대 소비자들의 신뢰를 잃지 않을 것이라는 확신을 갖는 것이 중요합니다. OTC: 지난 몇 년간 어떤 트랜드가 많이 성장했다고 생각하시나요? 그런 고객의 요구에 대해 CI 는 어떤 식으로 대처하셨나요? CI: 심플함입니다! 남성들은 보통 어떠한 추가적인 단계 없이 일상 생활에서 쉽게 해결할 수 있는 치료법을 찾습니다. 저희의 새 혁신법은 이러한 점에서 다른 경쟁자들과 비교했을 때 훨씬 낫다고 할 수 있습니다. Combe 는 흰 머리 처리에 대하여 부분 흰 머리 염색 (Touch Of Gray), 노 믹스 영구염모제 (AutoSTop) 그리고 가장 최근에 나오는 혁신 제품: 흰 머리를 서서히 줄여주는 샴푸 (Control GX) 등을 통해 제품들이 모든 남성들에게 공통적으로 적용될 수 있도록 선택 폭을 넓혔습니다. Aqua Velva 5-in-1 Sensitive Aftershave Balm 는 민감한 피부를 가진 남성들이 면도를 통해 겪는 상위 5개의 피부 문제를 완화시켜주며, 면도 자극이나 붉어짐 현상을 완화시켜주어 내생모나 면도 상처 등을 예방해 줍니다. OTC: 올 해 어떤 박람회에 참여하셨으며, 현재 생각하고 계시는 다른 박람회도 있는지요? 이런 이벤트들이 쇼 참석자들을 포함해 회사에 어떤 가치를 가지고 오나요? CI: Combe 는 올 해 여러 다문화 박람회를 참석했습니다. 저희의 주 목적은 저희의 기존 그리고 새 제품들에 대해 소매업자들을 교육하는 데에 있습니다. Combe 가 경쟁하는 이 분야는 소비자 교육을 꼭 필요로 하는 분야입니다. 만약 저희의 소매업자 파트너 분들이 제품에 대해 잘 교육이 돼있고 그로 인해 고객이 옳은 결정을 내릴 수 있게끔 도와드린다면, 분명 그 소비자는 잘못된 선택을 한 고객보다 더 많은 확률로 재 방문하여 재 구매할 것입니다. 이는 결국 상점 오너 분들의 판매량 증가와 수익으로 돌아올 것입니다. 또한 상점 주 분들이 매장에서 쇼핑을 하는 소비자들과 매우 가깝게 있으므로 이 또한 Combe 의 좋은 통계 자료가 될 것이라고 생각합니다!